You've arrived from the talented Anne Matasci's blog, Maui Stamper. Well, it took me a bit longer to get back here and fill in the details of my projects for this month's hop - thanks for being patient with me! I love BOTH of these cards so much and they are BOTH super simple to create - it's just layers, and I know you can do it! I used the color scheme of Blushing Bride, Baked Brown Sugar, Strawberry Slush and Very Vanilla to co-ordinate with the Soho Subway designer paper that I pulled for this project. All of the edges on all of the paper and cardstock are lightly sponged with Blushing Bride ink. 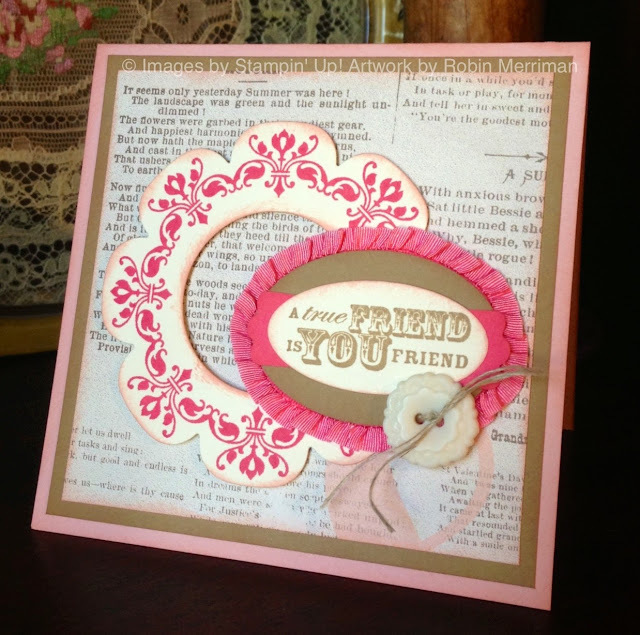 I used the Floral Framelits and the new Circles Framelits for the stamped circle element - the stamp set is Daydream Medallions. The focal image is done with the Extra Large Oval Punch, the Large Oval Punch and the Modern Label Punch. To apply the Ruffled Stretch Trim Ribbon, I added SNAIL to the back edge of the largest punched piece and simply wrapped around, adhering as I went. This new ribbon is beautiful to work with - I wish it came in ALL our colors! The button accent is from the Very Vintage Designer Buttons and is threaded with a snip of Linen Thread - the perfect final touch! 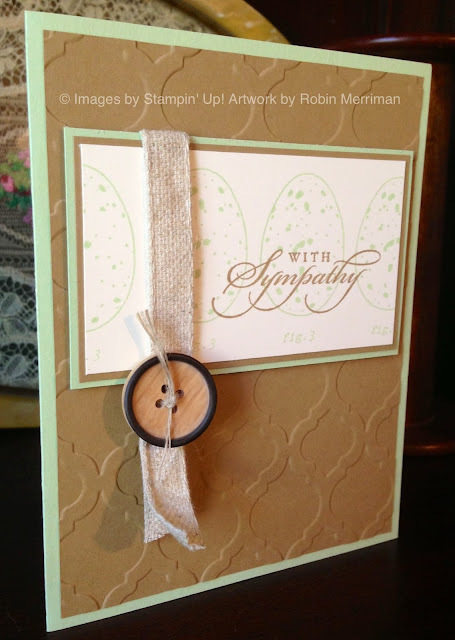 A very simple, but meaningful sympathy card. We all hate to make them, but we all need them from time to time and I'm so glad this Best of Greetings stamp set included this sympathy image. For my project, I used a color scheme of Pistachio Pudding and Baked Brown Sugar with Very Vanilla. The brown background piece is dry embossed with my Big Shot and the Modern Mosaic embossing folder. For the focal layers, I cut my pieces at 1/8" inches instead of the normal 1/4" for a more formal look. 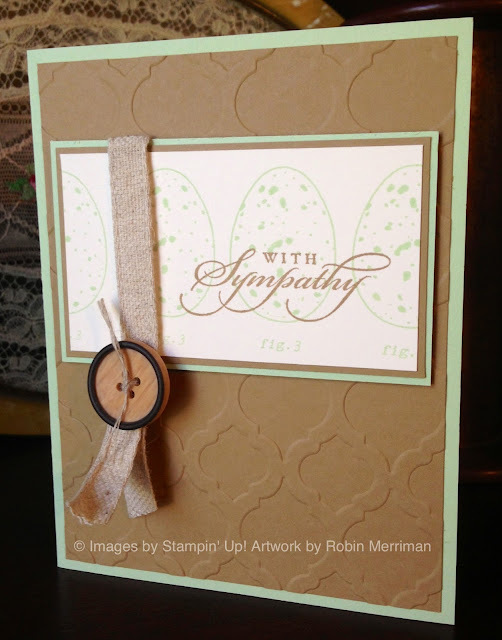 The top layer is stamped with the egg image from Backyard Basics in Pistachio Pudding. I used my Stamp-A-Ma-Jig to line them up perfectly. 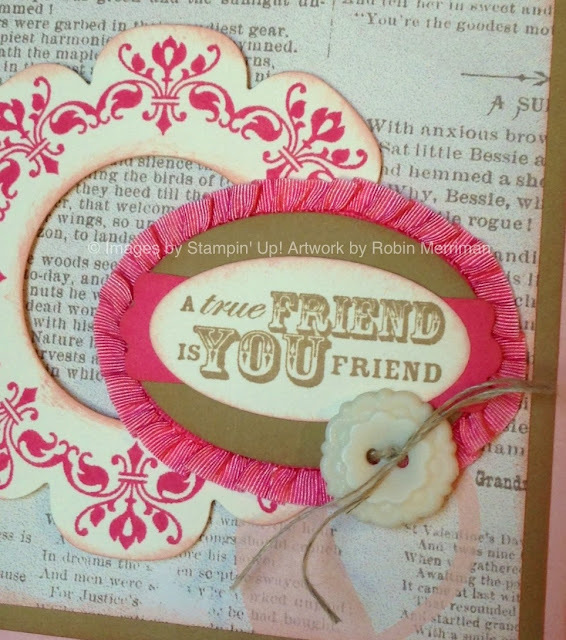 All of the layers were popped up on Stampin' Dimensionals and I wrapped a piece of Natural Trim Ribbon around them and tied it off with a piece of Linen Thread through a Naturals Designer Button. I hope you've enjoyed your stop here at my blog on the tour, you've still got lots of great ideas ahead of you so be sure to keep going! Just click on this icon to go to the next blog, you're headed for Andi Potler's blog - Absolute Kreations next.